It really is great to finally see it out. Great job! 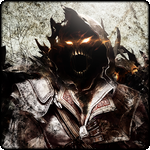 Last edited by darklord42 on Fri Apr 03, 2015 4:20 am, edited 1 time in total. darklord42 wrote: It really is great to finally see it out. Great job! Wouldn't surprise me if it turns out Zandronum 2.0 was just in development that long. And due to >developement you can't really just change the version you're adapting while you're in development. Basically, it's the curse where you're ALWAYS going to be (n) progress behind, where n is the amount of time it takes to create a new version of Zandronum, which means that ZDoom gets (n) ahead while we're catching up. Last edited by Untitled on Fri Apr 03, 2015 4:13 am, edited 1 time in total. Last edited by darklord42 on Fri Apr 03, 2015 4:30 am, edited 1 time in total. As I understand it, the Zand devs want to use a tried-and-true stable version of ZDoom as its base, so they will never use the newest version. New update feels great, thank you. Empyre wrote: As I understand it, the Zand devs want to use a tried-and-true stable version of ZDoom as its base, so they will never use the newest version. So we won't have in the future a Zand based on Zdoom 2.7.1 or higher version, is that what you mean ? AFAIK Zandronum 2.0 was almost fully ported to the current ZDoom base version few months ago... Everything after was testing and tracker tasks/bugs, and networking-related stuff. Last edited by ZZYZX on Fri Apr 03, 2015 10:49 am, edited 1 time in total. First thing I made, massive amount of particles that have gravity and slow down and fade out. Pretty much the same physics as firework explosion particles. A_ScaleVelocity can be quite cool. Oh, and abuse the hell out of FRandom. I am afarid im going to have to get you guys to hold da keyboard for a few. There is actually a ton off reasons why we are behind zdoom, and using a tried-and-stable build is not really one of them. The main one is backporting. 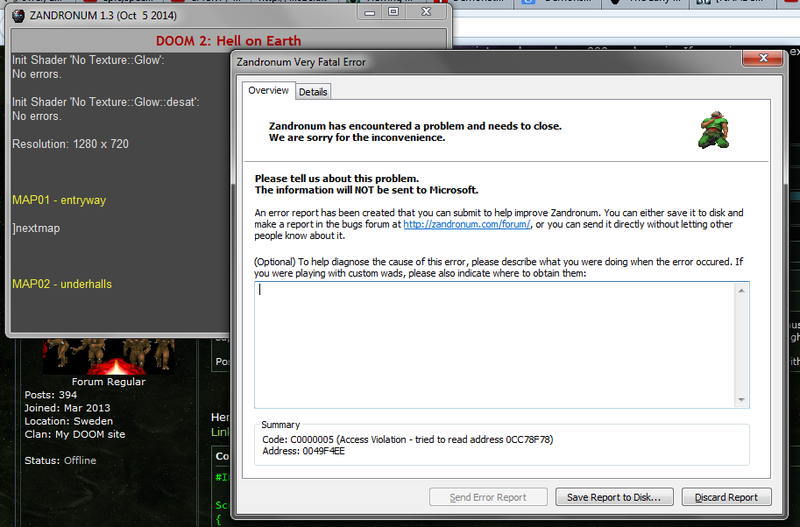 Theres a high chance that the new zdoom code wont work with zandronum, so the devs have to simply make it work, and test. It is a lot safer by going up by order in revisions then using the latest. It's a lot of work to upgrade the Zdoom base because of this, which in turn, it takes a lot of time to do this. Fr Blood, what I meant was that when Zandronum is eventually using ZDoom 2.7.1, that will by then no longer be the newest version, but as Mifu explained, I was wrong about the reason. 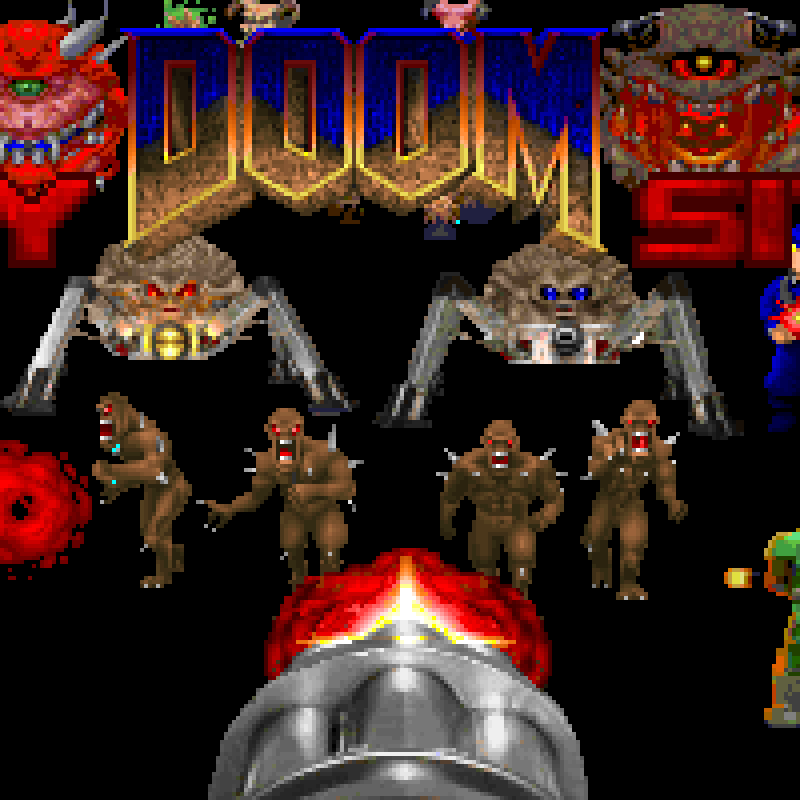 darklord42 wrote: Zdoom hasn't been touched in 2 years why not have use the latest of their code base? I wasn't aware that today was two years ago. Basically correct. The only thing that needs to be changed is Zandronum WILL get to 2.7.1. Can't say yet if that will be 3.0 or 4.0, but it will be one of those two. But yes, it comes down to the development time it takes to adapt the new features to the net code and get it tested. (We had a lot of trouble with the bold point and Torr really doesn't like doing releases with untested features.) Zandronum can't roll with the absolute latest development version of ZDoom as while that would be awesome for mod authors, those playing won't get the best experience due to frequent updates and breakage that hasn't had time to be resolved. In 1.3 you were able to use named scripts of type OPEN and ENTER. Vincent(PDP) wrote: In 1.3 you were able to use named scripts of type OPEN and ENTER. FYI, 1.3 was completely unaware of names scripts. So they were never supported. If they worked at all, then because acc silently converted them to numbered scripts with high numbers. Unfortunately, ZDoom 2.5.0 doesn't support script numbers above 999 (using them will simply crash the game, that's why I made Zandronum reject higher numbers). Possibly, I can lift this restriction, so that script numbers above 999 work again. If you give me an example wad with a script that worked in 1.3, but doesn't work anymore in 2.0, I'll see what I can do. Last edited by Vincent(PDP) on Wed Apr 08, 2015 8:13 pm, edited 1 time in total. This is how many people may feel with zandronum 2.0, idk if it's their fault, since well, it took something like 3 or 5 year to this update reach a high zdoom version. Last edited by ibm5155 on Wed Apr 08, 2015 9:30 pm, edited 1 time in total. This is not a good example, because it demonstrates perfectly why this was a bug that needed to be fixed. Last edited by TerminusEst13 on Thu Apr 09, 2015 3:15 am, edited 1 time in total. I raised the internal limit on the script numbers, here is a testing binary. While this is still not intended to support named scripts, it is intended to make 2.x accept mods that worked in 1.3. This version also doesn't seem to crash on nextmap with your example wad. BTW: Mentioning the nextmap crash was very helpful. It showed that I needed to do more changes than I initially expected. I've shown the link in the zatesting IRC channel. I hope this suffices. Last edited by Edward-san on Sun Apr 12, 2015 7:57 am, edited 1 time in total.